Clinique Redness Solution – It really works! 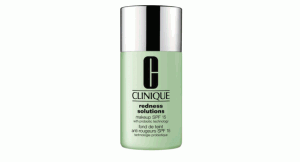 Clinque’s new Redness Solution Makeup actually works. If you want a product that will even out your complexion and cover redness, this is it. Yes, 40 something’s still get breakouts. I was flipping through a magazine and came across one of those mini product samples and gave it a try (spoiler alert– it’s a myth that skin issues disappear as we get older). Lo and behold, the makeup absorbed the redness and my skin appeared smooth and blemish free. Bonus. It also works to balance out ruddiness and blotchy areas. Clinique Redness Solution may be your answer too. I give this product the SpaSkinny seal of approval. If you try it, let me know what you think.